In a world full of immortals and mortals, the Forest of Burzee received an abandoned infant which is found by the nymphs. And Necile who wishes, even though it is against the law, to spare the child and raise it as her own. As he grows older Claus befriends the creatures of the forest and Ak, the Master Woodsman shows him the children of the world who he has sympathy for. When Claus reaches adulthood, he leaves the Forest of Burzee and travels to the country called the Laughing Valley where he builds his own home and receives a cat called Blinkie where he makes a wooden version of and gives it to a boy lost in a snow storm. The Ryls give him paint that they use to colour flowers so Claus can paint his toys. He later makes a variety of wooden animals who he decides to give to the children who are either rich or poor including Bessie Blithesome and Mayrie. An evil army called the Awgwas realize the toys are making the children less naughty so they attempt to stop that by kidnapping Claus and dumping him in the jungle, trap him in a blocked cave and steal the toys from the children forcing Claus to seek shelter. A beautiful book. 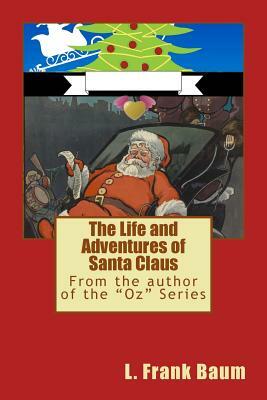 Will definitely make you feel the warmth and love and giving-nature of Santa Claus in your heart this time of year. Baum wrote this book for one of his sons. This short, quick read is perfect for children and adults alike. Lyman Frank Baum (May 15, 1856 - May 6, 1919), was an American author who was a specialist in children's books. He was particularly famous for his The Wonderful Wizard of Oz series, a sensational hit among children and continues to do so. He was better known by his pen name L. Frank Baum. His stories have formed the basis for such popular films as The Wizard of Oz (1939), produced by the famous Metro-Goldwyn-Mayer Studios Inc. and Oz the Great and Powerful (2013). Named "Lyman" after his uncle, Baum didn't like his first name much obviously and chose to be called by his middle name "Frank" instead. Baum wrote about his purpose in introduction of his book: "The Wonderful Wizard of Oz was written solely to pleasure children today. It aspires to being a modernized fairy tale, in which the wonderment and joy are retained and the heart-aches and nightmares are left out."